Summertime is a great opportunity to experiment with foods other than seed on your bird feeding menu. Try skewering orange or apple halves on a tree branch for tanagers, grosbeaks and orioles. 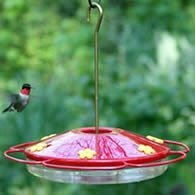 Thrashers, mockingbirds and catbirds also enjoy fruit, including bananas and watermelon, which attract insects such as fruit flies that in turn may attract hummingbirds. 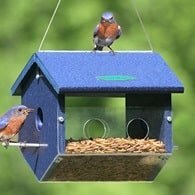 You can attract Bluebirds, Robins, and other birds by providing mealworms. These are the larvae of beetles and can either be purchased at pet stores or online. Some folks raise their own to always have some on hand. Baby birds need protein that insects provide so this is a good option. 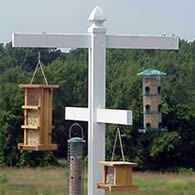 Be alert for unusual visitors as curious migrants stop to investigate the activity around your feeding stations. In between spring and fall migrations, the action is like watching a soap opera as dominant males vie for the best spots, trying to impress the females. 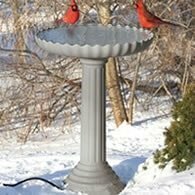 Later, when your neighborhood birds are raising their young, notice how the adults bring around their young for lessons in getting food and water. Once the juveniles start coming on their own, you will have the opportunity to study their plumage before they molt into adult feathers. 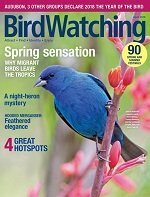 Patterns and color show the greatest variations during the time between fledging and fall migration; the differences between some of the fledglings and their parents is amazing. There is no doubt that summer's birds are unique entertainment.